We currently recognize 927 species and 179 genera of freshwater mussels in six families. The bases for our family-group level classification are the published phylogenetic analyses of molecular and morphological characters. Click here for more information about the classification of freshwater mussels. For four of the six families, where there is sufficient phylogenetic diversity, the families are divided among various subfamilies and tribes. Each of the families is discussed individually. UNIONIDAE: 139 genera, 717 spp. 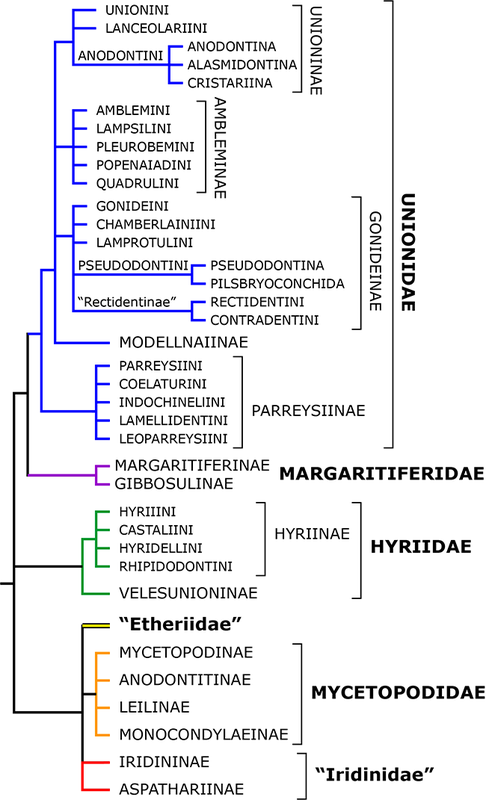 MARGARITIFERIDAE: 4 genera, 17 spp. HYRIIDAE: 15 genera, 96 spp. ETHERIIDAE: 5 genera, 4 spp. MYCETOPODIDAE: 11 genera, 53 spp. IRIDINIDAE: 6 genera, 40 spp. TOTAL: 179 genera, 927 spp. Follow the links to find information about the distribution of each family and to see a list of all included species and genera. 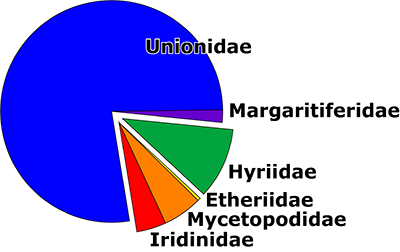 The Unionidae is by far the richest of the six families, and it is also the most widespread. Information about the biogeographical patterns of the Unionidae (and other families) can be found in the Geographical Summary.